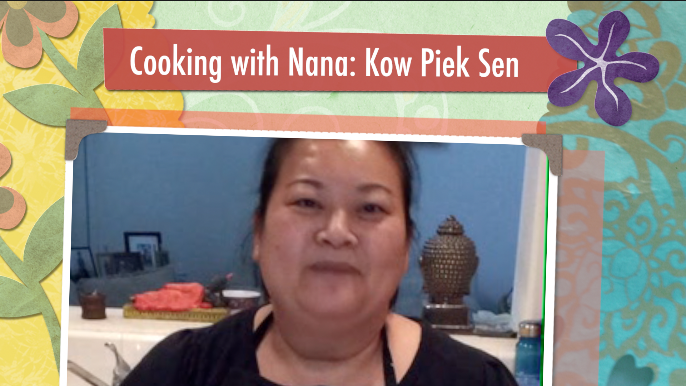 If you look for Lao cooking on the web, chances are one of the first things you’ll find is the Cooking with Nana show on youtube. 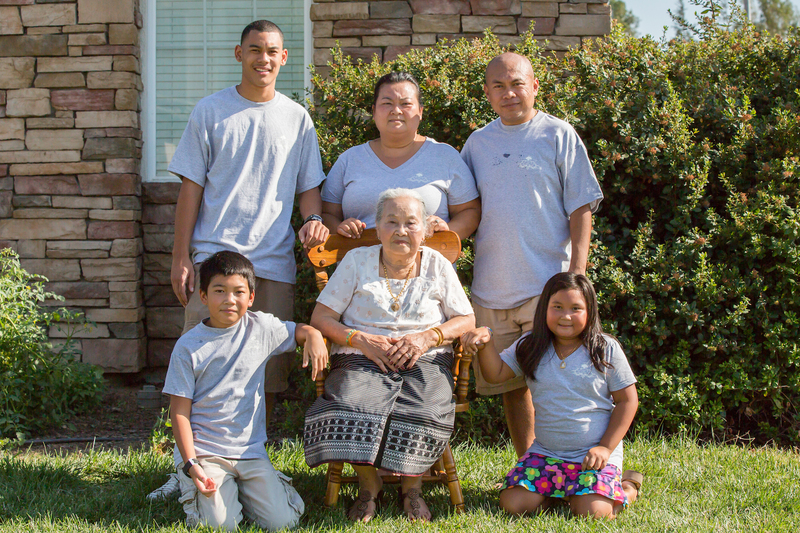 Now in their second year and almost 50 videos uploaded, Nana Sanavongsay and her family have been working hard to build an interest in modern Lao cooking in the United States and around the globe. Her videos have been viewed over half a million times with over 6,000 subscribers. Even though she gets recognized in the streets now as Nana from Cooking with Nana she remains modest about her show but enthusiastic about the joys of Lao cooking. Today is the 2 year anniversary of her very first video, so we caught up with her to learn more about the vision and voice behind Cooking with Nana! 1) Can you tell us a little about yourself and your family? How did you get to the US? I was born in Ban Sikhay in Vientiane, Laos. I have 5 sisters and 4 brothers. One of the brothers is my twin. My family was sponsored by a family in Midland, Texas. We arrived there in 1979. My stepfather supported us, working as a janitor. Eventually, my mom got a job at IBP, a beef processing plant in Amarillo, Texas. My mom moved there first before the rest of us followed. After about 3 years, we moved to California. I studied in 5th grade until I graduated from Merced High School in 1991. I graduated from high school, and moved back to Amarillo to stay with my sister. While there, I got a job at IBP. 3 years went by, and I decided to move back to Merced, California, to attend college. While going to school, I was also delivering newspapers in the morning. After two years of college, I left to get a full-time job. My first full-time job was at Panda Express, where I started as a server. After a while, I started helping with the food preparation and cooking. 2 years later, a friend offered me a job at a printing plant. I worked there for about 5 years. I worked at night at the printing plant. Sometimes, I couldn’t sleep after work. So, I went online and chatted with other Lao people. That was where I met my husband, Alisak. In 2000, I moved to Minnesota to stayed with my cousin. I stayed there for about a month before I moved to Elgin, Illinois, and got married. While in Elgin, a lot of my husband’s family and friends found out that I could cook. I started hosting lots of get-togethers at my house and more and more people started ordering food from me. I moved back to Merced in 2009 with my husband and three kids. We have been here ever since. 2) How did you learn to cook? I learned to cook from watching my mom and step-dad. I liked to observe and ask questions. They encouraged me to try, but I was too scared. I didn’t start cooking on my own until I was about 12 years old. I kept learning and practicing. The first Cooking with Nana video! 3) How did Cooking with Nana get started? Cooking with Nana started with some friends calling and asking me how to make lots of different dishes. After a while, I thought it would be better if I just made a video and shared with my close friends. I had a lot of people ask me how I make my khow piek noodles. So, that was the first video I made. In late November, 2011, my husband posted the video on Facebook to share with his friends and my friends. Then, some friends asked me to post it on YouTube so that their friends could see it, too. After posting the first video on YouTube, I decided to make some more. I made 6 videos, and we decided to take a break for while. It became one year before I made another video. During that year, my 6 videos got a total of 60,000 views. After I started doing videos again, my husband decided to created a “Cooking with Nana” page on Facebook. Since the month after I came back on YouTube, my videos averaged about 60,000 views total per month. 4) What do you see as the big plans for what you’d like to do next with Cooking with Nana? I want to make as many videos as I can to help bring Lao food to the mainstream. Currently, we don’t have many restaurants that serve Lao food. I hope to inspire people to want to cook and eat Lao food. I’ve had several video networks contact me to help me bring my videos to a wider audience, but my husband and I decided that we should do it on our own for now. 5) What’s the best compliment someone has given you about your cooking? 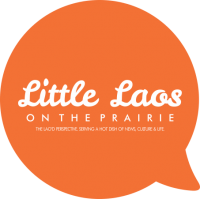 I think the best compliment I’ve gotten about my cooking was when I taught a cooking class for the Center for Lao Studies’ “Taste of Laos” event. One of the students who had never tried padek before told me that the ‘gang nor mai’ with padek tasted better than without. I just love people who are open to trying something new. And as for my cooking videos, I love to hear about non-Lao viewers who are able to impress their significant others by cooking Lao food for them. I’m so glad that I can help people learn to cook Lao dishes. 6) You cook a lot of dishes, but what’s your favorite to cook? Som Moo, Cooking with Nana style! 7) What’s the most important advice you’d give to someone just starting to learn Lao cooking? The most important advice I would give is to find out how Lao dishes should really taste. Try to taste dishes from as many different chefs as possible. Get lots of practice and invite constructive criticism. 8) What’s the most difficult dish for you to cook? I don’t think there are any dishes that are difficult to cook. Some dishes just take more time than others. 9) Who inspires you as a cook? My mom inspires me as a cook. When I was younger, my mom used to make lots of dishes to sell for extra income to support our family. 10) What dish do you think every Lao person should know how to make? You can learn more about Lao cooking by subscribing to the Cooking With Nana channel on Youtube or by visiting them on facebook at: https://www.facebook.com/CookingWithNana. And if you ever get a chance for a one-on-one cooking lesson with her, take her up on it! I learned a lot in just 30 minutes! I was impressed with her instructions and her patient in taking time to explain each ingredient and alternative ingredient if one prefers. Thank you so much for sharing. I will try your recipes. They all look good!